Sorry kids, the indoor pool is just for the grownups. Grab your buckets and shovels and get ready to play in the sand. There’s nothing like a refreshing drink at the end of a long day. 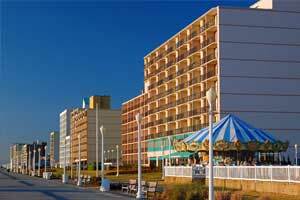 The resort provides direct access to Virginia Beach. The kids will love the game room and they won't be able to get enough of the splash pad. Don't let the weather get in the way of your underwater fun – the resort has an indoor pool.